First Line Supervisor Test to assess Aptitude Skills of applicants. The first line supervisors have to manage the labor in order to meet production targets. They need to possess good managerial and administrative skills. They need to deal with a wide range of skill sets within a production climate. This includes, but is not limited to assemblers, machinists, maintenance, material handlers and team/group leaders. Monitor the quality of the employees’ work and provide any needed assistance in order to ensure quality products and safety of the employees. Assure proper management of all production shifts and employees. Coordinate manufacturing needs with other departments and provides support to other departments in attaining of the company’s mission of customer satisfaction. Assure that the needed training is provided to employees. Assure the effectiveness and accuracy of equipment and tooling used in the manufacturing operation. Assist in diagnosing equipment and tooling malfunctions. Expedite and coordinate repairs and/or replacement with department and plant maintenance and engineering groups. Anticipate production problems (i.e. material outages, equipment malfunctions), and where feasible, develop and implement preventive action to offset a loss of production and/or poor quality production. Provide inputs regarding cost reductions, work simplification, production scheduling, labor planning, and process improvement. Q 2. 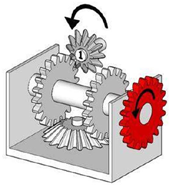 Cogwheel number 1 rotates counterclockwise as shown. If the red cogwheel rotates in the direction of the arrow choose option 1; if it rotates in the opposite direction choose option 2; if the red cogwheel does not move at all choose option 3. Q 3. The diagram shows two fixed cogwheels which can only rotate around their own axis. A rack is inserted between the two cogwheels and is moved in the direction shown by the arrow. What are the directions of movement and velocities of the cogwheels?